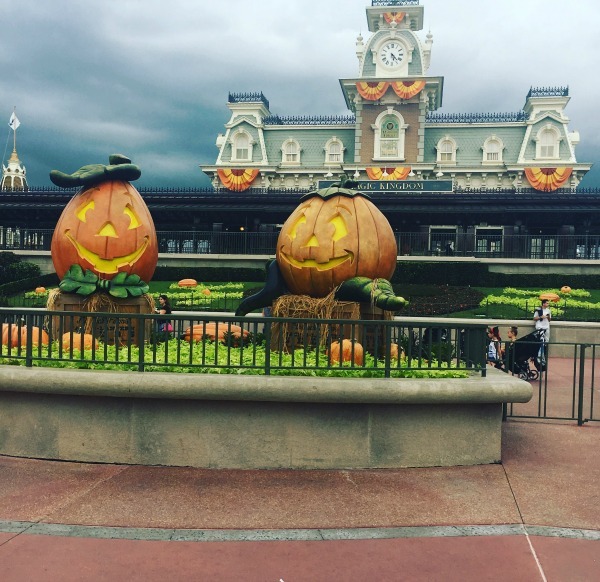 We are very lucky to visit Walt Disney World on more than one occasion, and whilst Halloween isn’t my favourite season of the year, I loved watching Youtube videos seeing Magic Kingdom dressed in its Halloween glory. 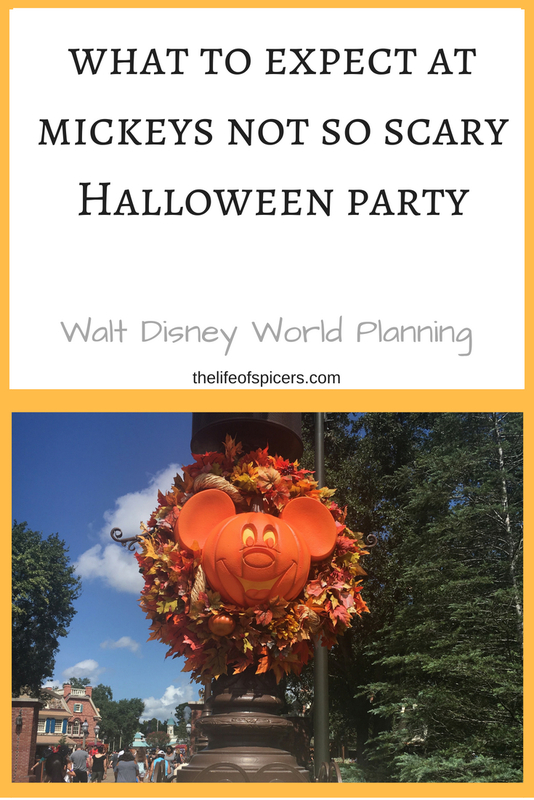 The way our holidays work, I wasn’t sure we would ever be able to visit during the Halloween season at Walt Disney World, however when the dates for Mickey’s Not So Scary Halloween Party were announced for this year, the first party was in August, and on the last night of our holiday. I knew we had to get tickets as this really could be a once in a lifetime opportunity for us. Seeing the dates released meant that we would also see Magic Kingdom dressed in its Halloween glory as well. I thought this may happen on the day of the party, but it actually happened a few days before meaning we also got to visit the park during the day time to appreciate the decorations. 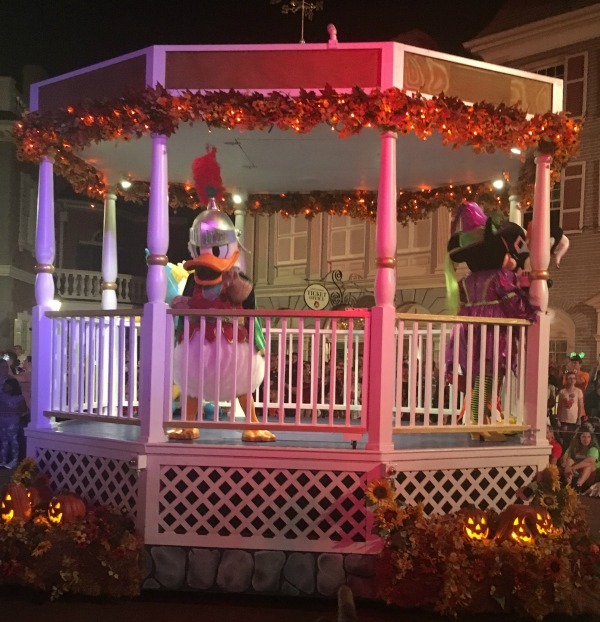 I have read a lot about Mickey’s Not So Scary Halloween Party and watched lots of videos, so I was excited to be able to watch the different parade, castle show, fireworks and also do some trick or treating. We had planned to get dressed up but time escaped us and in the end we didn’t. I was wondering if we would be the odd ones out by not dressing up but actually it was about 50/50 so we didn’t feel out-of-place at all. In actual fact being August, it was very hot and I was glad I wasn’t wearing some of the costumes I saw people walking around in during the party. On the day of the party, ticket holders can have access to their party wrist bands from 4pm, and access to the park if you don’t already have a day park ticket. Non party ticket holders are asked to leave the park at 7pm. We arrived at around 4.30pm not really sure what would be available to us before 7pm. We entered through the turn stiles and collected our party wristband before collecting our park map for the evening which showed where all the trick or treat stops would be, where you could buy the Halloween snacks and where the photos photographers would be etc. 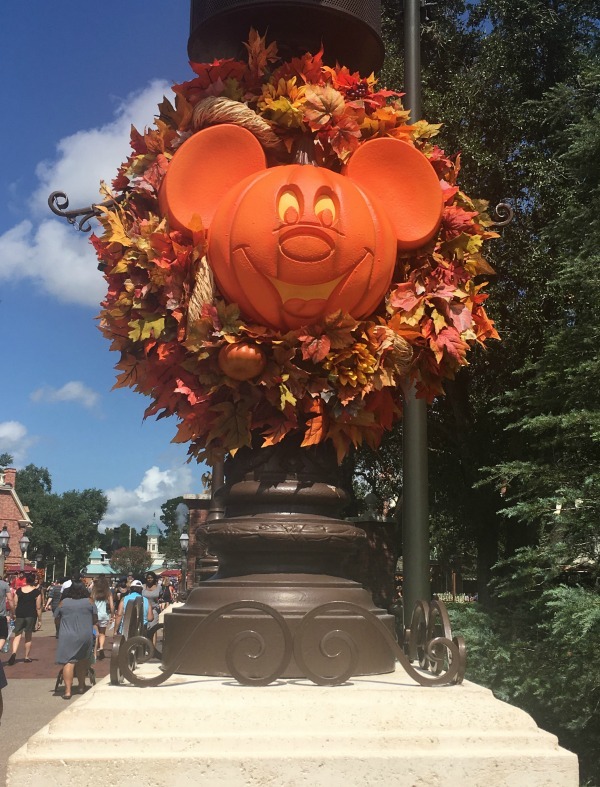 A Mickey’s Not So Scary Halloween Party can be a great opportunity to meet some rarer characters such as the Seven Dwarfs, Jack and Sally and more. I had toyed with the idea of queuing for the Dwarfs, however I knew the queues would be long and I wasn’t sure how the evening would play out, so I decided that we would just enjoy the time we had. As we arrived at 4.30pm and the party carried on until midnight, I thought we were going to have plenty of time to see everything. I don’t know where the time went but it was gone in a flash and when we left just after 11pm as Hubby’s foot was playing up, I felt like we had been in the park for about an hour! We spent the first couple of hours before the candy station opened using a Fastpass, collecting the special Sorcerers of the Magic Kingdom Halloween card, and eating dinner. We noticed that a lot of the quick service restaurants were shutting at 6pm, with just the larger ones staying open such as Peco Bills and Starlight Cafe. This was fine I just hadn’t realised before hand and was looking forward to a flat bread from Pinocchio’s. It decided to rain early in the evening which was a shame but thankfully it didn’t last long in true Florida style and we were on our way to eat anyway so missed most of it. Once 7pm arrives the treat stations open and Fastpasses are no longer available. The queues for the rides though were much shorter than on a normal day which was great. We didn’t get to ride too many rides but if that had been our plan I think we would have packed a lot in. 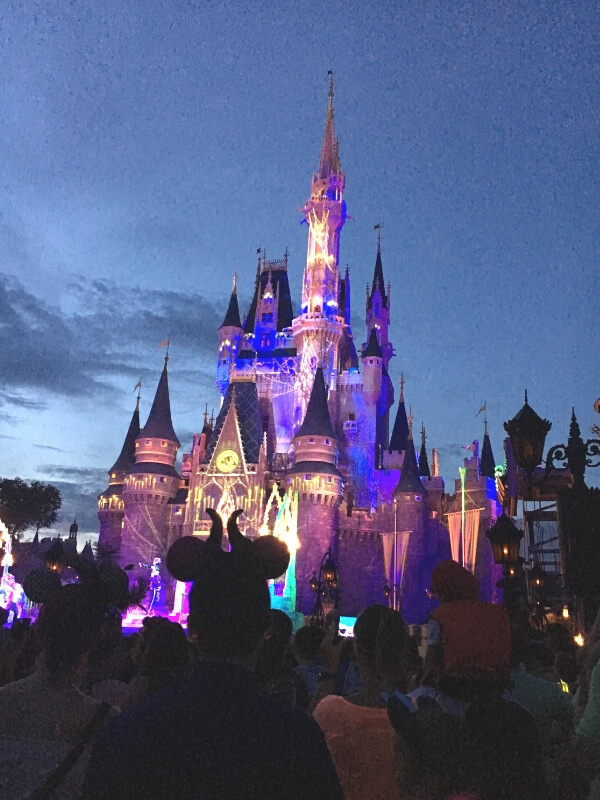 The schedule for the evening contained two castle shows, two Boo To You Parades and one Hallowishes. We had already decided to catch the first castle show at 8.15pm, the first parade at 9.15pm and then Hallowishes at 10.15pm. I have been told that the second parade and castle show will always be quieter than the first, however we had made our plan and I think it worked out OK for us. We began the evening after 7pm by collecting candy in Tomorrowland. The queues were long as expected at the beginning of the night, but moved quickly. We wandered through to the Hub area in front of the castle just before 8.15pm, and stood quite close to the castle. There were a lot of crowds so we didn’t have a great view, but we could hear it all, and I wasn’t sure I wanted to spend hours saving a spot for this one. As the crowds dispersed we moved around the Liberty Square and took a spot in front of the Christmas Shop for the parade. We sat down for half an hour to rest feet and saved our spot. This worked out really well but we were next to a walkway so the amount of people who arrived just before the parade started and attempted to push in front was immense and a little overwhelming. We had a great view however and despite parents pushing their children to the front in an attempt to getting in front themselves, we kept our view. Instead of following the crowds that followed the parade around to Main Street, we went in the opposite direction and began trick or treating in Adventureland and Frontierland. This worked out quite well as the queues weren’t long at all, before walking back to the Hub area for a spot for Hallowishes. 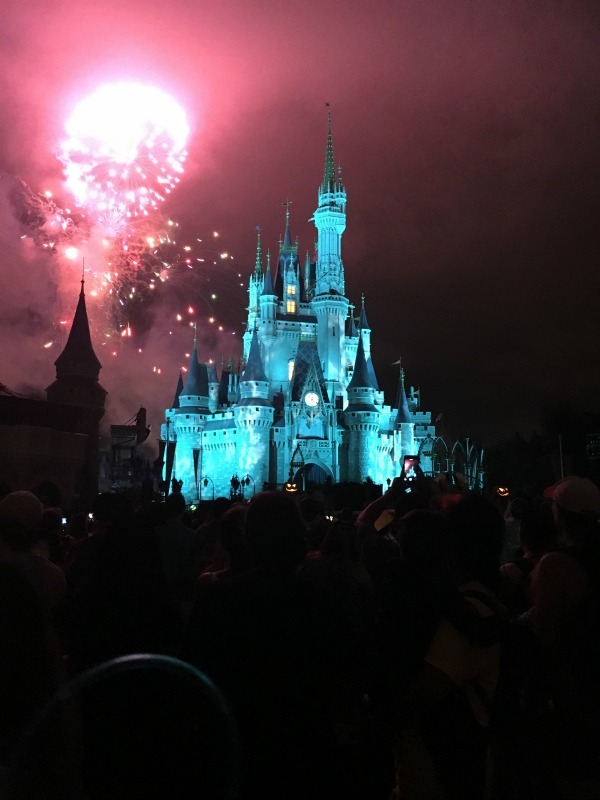 We had a great spot in front of the castle, and unlike the castle show, you will still see everything as fireworks happen in the air. We didn’t feel hemmed in like we did for the parade and had plenty of space to enjoy the fireworks. This was a great adaptation of the Wishes firework show that used to happen in Magic Kingdom, and I was really pleased we got to watch it. Hubby’s foot was really hurting him, so we popped into Fantasyland to ride the tea cups and Abby wanted to ride them in the dark. If we had wanted to meet the Mad Hatter, Alice, Tweedledum and Tweedledee, and the Queen of Hearts, this would be the place to do it. They also arrived back out just as the fireworks finished so it would be a great time to meet them. It started to rain again at this point, so we walked back down main street with a last stop for candy, dodging the people sitting waiting for the second parade and left the park at 11.15pm. Wow where did the time go! We had a great time at Mickey’s Not So Scary Halloween Party and I’m so glad we had the opportunity to attend. I thought the park was busy, but I have read comments from seasoned party goers that it was a quiet night, so I can imagine it would be quite crazy on 31st October if you chose to attend then. 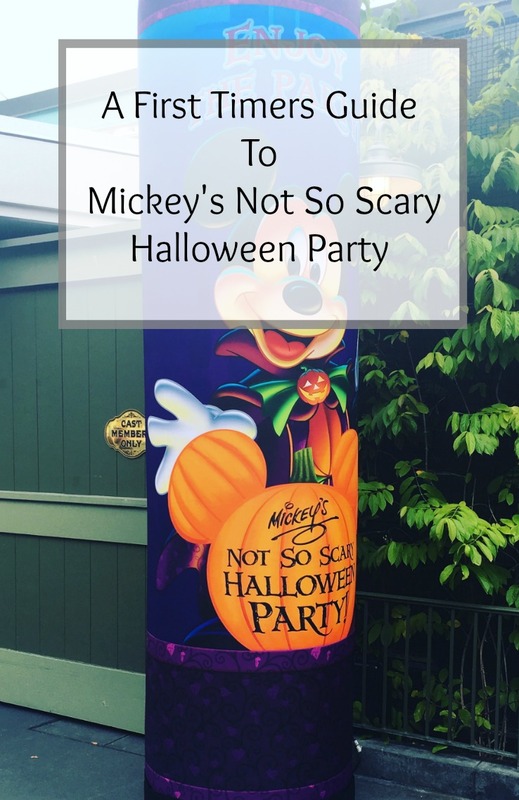 We did the Mickey’s Not So Scary Halloween Party last year (2017), and I have to say it was THE biggest colossal waste of money that I’ve ever spent at Disney! No FastPasses after 7pm is not the way to go, Disney! The crowd level does NOT go down once the non-party people leave. There were still long lines (up to an hour wait for the popular ones) after 7pm. So, needless to say, w/o the FastPass, we couldn’t ride a lot of the rides. Then the parade we were really forward to, the reason we even decided to go to the event. Never saw it. We staked out a spot long before it started, then countless people just crammed themselves in front of us then put their kids on their shoulders. Not only did we miss the headless horseman, we missed the entire parade! 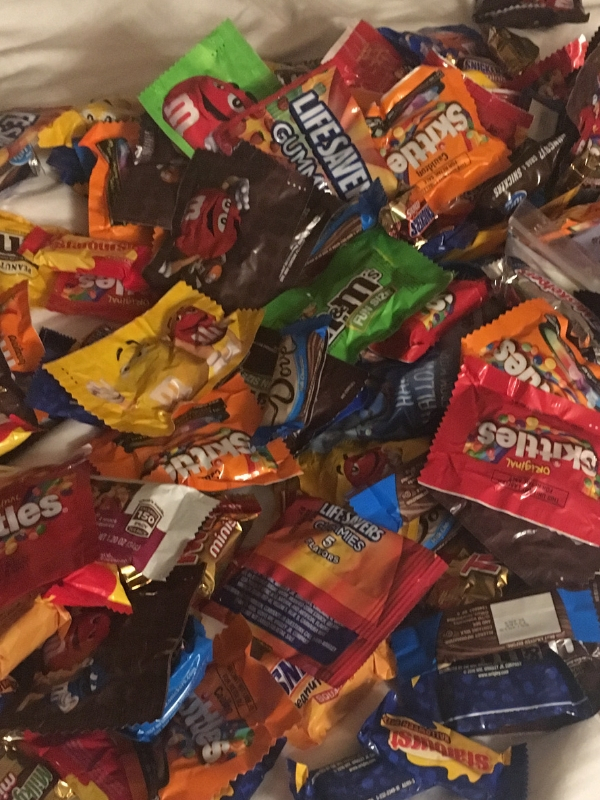 Everything I’d read said to wait until after the parade to trick-or-treat. WRONG! Luckily we did some before the parade, otherwise we would have gone home empty handed. After the parade was over, we went back to trick-or-treating, but the spots were closed. No more candy was being handed out. All in all, it was so frustrating that we ended up leaving early before the fireworks. We were going to go to the Mickey’s Very Merry Christmas Party this year when we go in November, but not after the Halloween party! $200 for a few hours of not being able to get on rides, see any of the characters or the parades is a TOTAL waste of money! Never again! that’s a shame you didn’t have a very good experience. 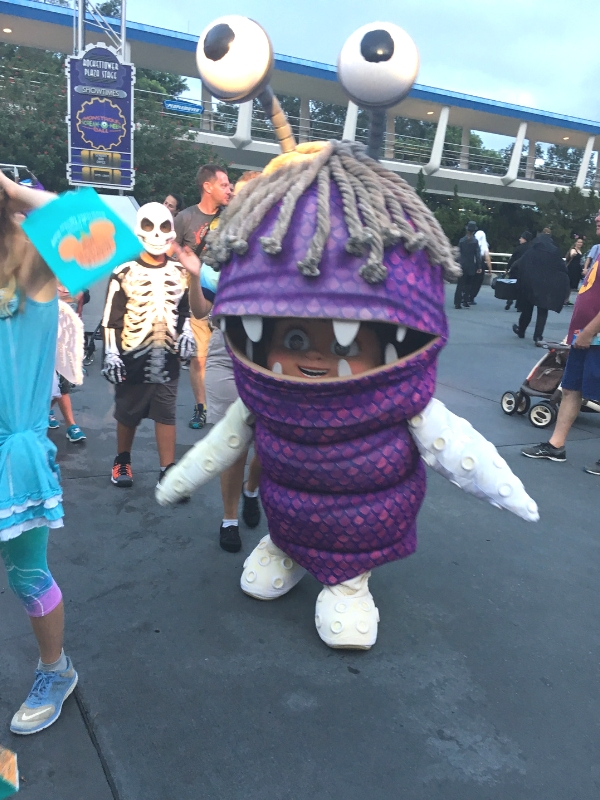 We found plenty of trick or treat stations open after the parades as we had started in tomorrowland before the parade and then carried on in adventure land after it as everyone was heading the other way towards the castle. We did the same thing. We went from Tomorrowland to Fantasyland first. We got one or two in Frontierland before staking out our spot at Pecos Bill (heard it was better to be in Frontierland for the parade if you wanted a spot. But after it, the places in Frontierland, Liberty Square, and Main Street were gone. The signs weren’t even up anymore.